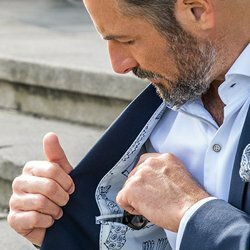 The business wear section features suits, sport coats, shirts and ties by top quality manufacturers, such as Coppley, Baumler and Samuelsohn. Coppley offers great value in suitings as well as quality custom clothing delivered within 3 weeks. Baulmer gives the customer the option of a softer shouldered European fit. You can also find a large collection of Samuelsohn at Tyner-Shorten Clothiers. Their attention to detail, classic fabrics and fit make Samuelsohn an excellent choice, and the best men's clothing Tyner-Shorten Clothiers has to offer. Stop by our store in London, Ontario and browse our incredible collection of men's dress pants, men's dress shirts, and many other menswear options. See the Tyner -Shorten Brand clothing line. Style meets comfort. View our footwear.